The attack on local Hip Hop continues. 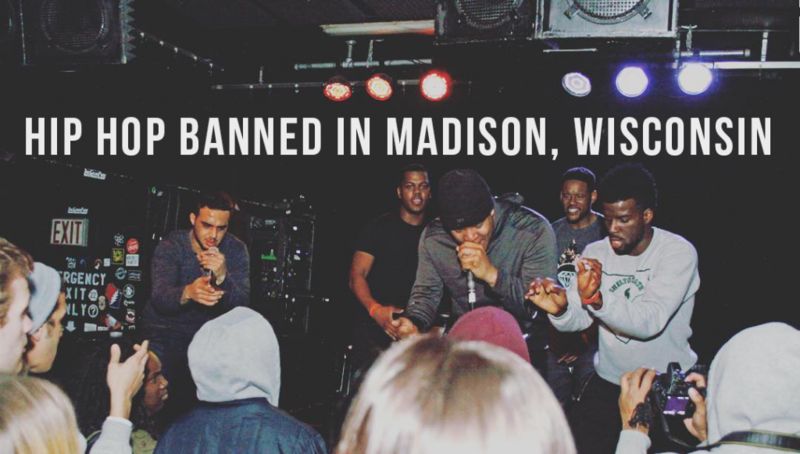 A few hours ago, the popular downtown Madison, Wisconsin venue announced a “1 year ban from the genre for third fight at differing Hip Hop shows over the last two months” (March 3, 2016). The attack on local Hip Hop continues. I don’t see this as a solution, I see it as an unwillingness to adapt and learn about the different local flavors of Hip Hop. This is a pursuit that local scenes in Atlanta, New Orleans, St. Louis, Houston, Minneapolis, St. Paul, Detroit, Seattle and Chicago had to figure out to bring multi-million dollar enterprises to the city. There are less people in Madison, very few venues that support the culture, and The Frequency was one of the last ones downtown. This is no good. I don’t think these venues are seeing the big picture here. There have been fights and that’s unfortunate but this is not the community’s fault. This is the owner Darwin Sampson’s fault for not properly preparing. Sall love to the places that have supported up til now, and to those who have tried to put on for the culture, but this ain’t going in a “Forward” direction at all. This is the time to put on, not shut down the movement completely. The talent is flush in the 608 (basementmade.com) and many artists are now getting national looks. The scene is young and so is the online audience, which is where these rappers have had to compete to get play. The young cats did this without the suits. Imagine if Hip Hop was supported like Rock, Folk or Country music is. Maybe these people are scared of violence, or maybe they’re scared to see the change that progress will bring. Either way, there are many different “genres” within Hip Hop locally. To see this kind of rhetoric coming from a venue that has supported rap music the past, speaks volumes to the disconnect in musical knowledge between the old heads and the musical audience of Madison, Wisconsin. Hip Hop is pop music. The “genre” has the most widespread audience in America, and while taking “a break from the scene” locally isn’t overtly racist, it perpetuates negative stereotypes towards Madison Hip Hop artists – who are predominantly black and from the lower class – doing further damage to one of America’s most outspoken communities and pushing many promising up-and-comers out of town. I do not condone this form of trendy segregation. That’s a no go. The Frequency has supported more than others in the past but that still doesn’t excuse them for their lack of critical thinking and deeply flawed logic. Hip Hop at its core is about spreading love and speaking up for those that don’t have a voice. 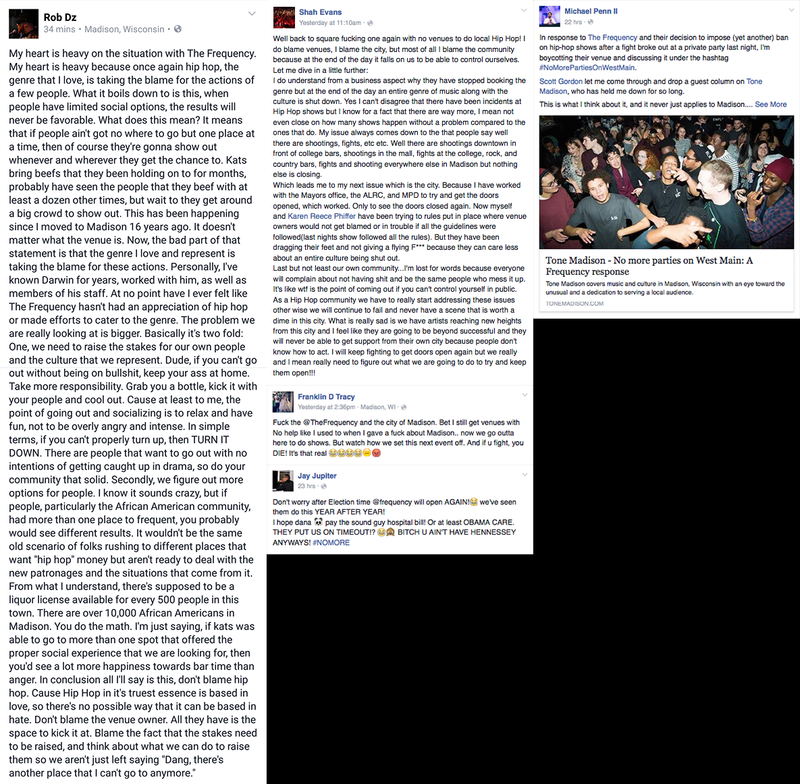 Here are a few other posts on the subject from the Madison Hip Hop culture, Michael Penn of First Wave, and Scott Gordon of Tone Madison.